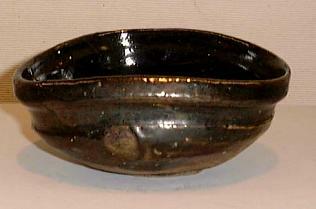 Very few potters in the current Japanese ceramic world make chadogu (tea utensils) as well as Tsujimura Shiro (1947 --). He doesn't concentrate on any one genre though -- he fires Shigaraki, Iga, Shino, Kohiki, Ido, Oku-Korai, Kuro Oribe and Setoguro all with the same intensity and finesse. 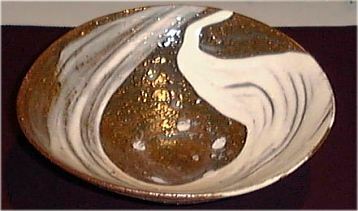 He was honored with a solo chadogu exhibition at the Kyoto Chado Shiryokan in 1999, only the second contemporary pottery to have such an exhibition after Kyoto veteran Fujihira Shin. Recently he had a very successful exhibition in Tokyo at Mitsukoshi Department Store's Art Salon that was entitled Kuro Chawan no Sekai or The World Of Black Tea Bowls. Mitsukoshi has two quite large galleries which they usually partition off into two separate spaces, but for Tsujimura the two rooms became one. Walking into the large space I was met with a display counter that ran around the breath of the room and had only kuro chawan lined up like soldiers at attention. What amazed me, after talking to Tsujimura, was that he'd only started to prepare for this exhibition some three short months ago! Now most mortal potters would have been at the wheel for months on end to meet the expectations of such a large exhibition at a premiere Tokyo gallery. Not Tsujimura though. With his nonchalant attitude, it was really nothing as he put it. Hah! It was a Herculean task as far as I was concerned with at least seventy Setoguro (Black Seto) and Kuro-Oribe (Black Oribe) standing at attention ready for inspection. And inspect I did. 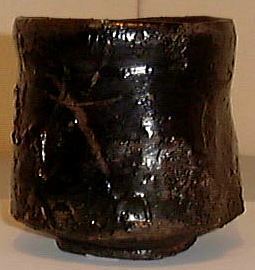 What I was surprised to find was that for the heavy image that black imparts, the chawan were -- for the most part -- quite light. 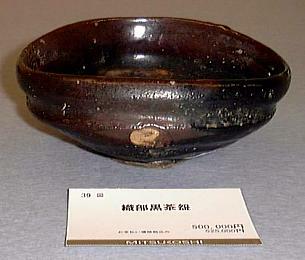 Some were jet-black while others had shades of rust, chocolate, and even white that occurred due to the different ways that Tsujimura cools the bowls. 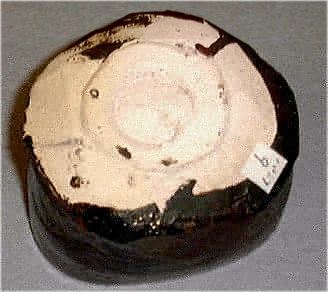 Many had finely carved kodai on white clay bases which offered a nice contrast to the dark bodies. As can be expected, some were better than others but for the most part they were all full of hin (grace) and would suit almost any tea gathering. 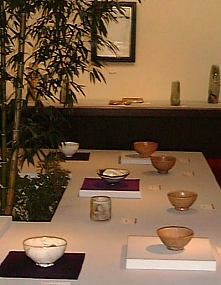 All the chawan were priced at 500,000 yen. Walking around the corner one was met by a middle table with a large bamboo tree set around a counter on which were placed other chawan styles. 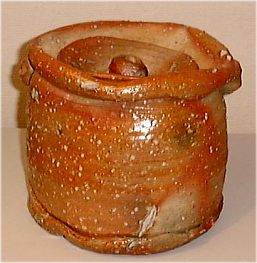 These included some of the aforementioned styles as well as Hakeme (below photo) which was one of the chawan that I didn't care for much; I liked the sweeping part on the left but found the thickness of the slip on the right a bit much. 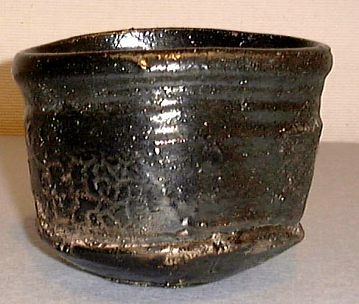 Also included in the exhibition were a few chaire, plates, kogo, a great Shigaraki mizusashi (see below photo), and some tsubo that looked as if they'd flown in from the Kamakura period -- they were dynamite! Tsujimura is on a plane all alone -- he doesn't have the -eenth generation number after his name that so many tea enthusiasts bow down to in semi-worship. 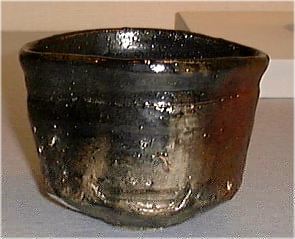 Tsujimura seems to be beyond that often stiff world and that detachment is what allows him to craft such fine vessels. Click here for my newspaper review of this exhibition (Japan Times). Click here for Jan. 2003 story for the Japan Times.